There has been a quick shift in the work habits of the people around the globe. With the emergence of smartphone devices, the traditional work model has now become a distant memory. Nowadays, employees prefer working from outside the office, with their mobile devices to accomplish their business tasks. According to a report, for the least part of the time, in a day, 61% workers have been working from outside. This shift in the work habits of the employees showcases the evolving nature of work. Moreover, it lays emphasis on the need of organizations to better manage employee mobility; so that three basic demands- security, productivity and agility, are met. Enterprise mobility can be best described as a modern task-force management practice adopted by most large organizations whose employees are on job mostly outside office premises and need to be ‘Mobile’ most of the time. Enterprise Mobility also focuses on workforce efficiency whether they work out of office or from outside, enabling them be productive, stay connected with various apps, access key information and increase efficiency with the help of mobile/tablet applications wherever they are! Enterprise Mobile Apps best exploits the remote working infrastructure deployed on Private or Public clouds. Well, this is increasingly becoming popular among the organizations which once relied on traditional office model. Enterprise mobility nowadays is for almost all organizations intending to increase workforce efficiency and effectiveness engaged in variety of fields, viz. Sales & Client Engagement, Accounts & Finance, HR, Campaign Management & Surveys, field operations and services. Moreover, the enhanced usage of social media and cloud apps integration has contributed largely to the emergence of enterprise mobility. What is the need of Custom Enterprise Mobility Solutions? According to a report by strategy analyst, it is a forecast that smartphone user base will grow approximately 58% from 2016 to 2022. There has been an inundation of smartphone devices and the number of apps being written for them. Due to this inundation, it is becoming a nightmare for the Enterprise IT to deal with them efficiently. Along with these devices come issues related to security and access. For instance, users bringing their devices at work bring their own network along with them. By connecting the devices to their personal network, they can put corporate information at risk. It is because the corporate information being used at these personal networks, can’t be monitored. Let us have a glimpse at some of the challenges that are being faced by the enterprises. Other than large organizations, for Small and mid-size companies it is becoming mandate to form their policies that would revolve around enablement, management, control and securing the DAC (devices, application and content). They need to build solutions encompassing Enterprise Mobility Management. Now it is on the enterprises to decide which EMM solution to choose for their business model. Based on the size of the organization, all listed above are strategically deployed at various stages. Let us now explore each flavor of EMM solution. MDM solutions work by creating an agent built for the device. It runs as a daemon and monitors all policies of enterprises. MDM is majorly for enterprise owned devices because it controls the whole device. It might not be accepted for BYOD and B2C; where users bring their own devices for corporate work also. MDM is able to execute intelligence that is based on configurable enterprise policies at the device level. It is not applicable for those situations where a policy or rule of an enterprise needs to be applied on some specific applications. Also, there are limitations of using MDM, such as the employee needs to carry two devices – personal and official, to separate enterprise data from the personal one. Further, deployment of MDM solutions doesn’t make it cost effective due to procurement, operational and capital cost. This (Bring Your Own Device) is a new trending concept in enterprise mobility management. Enterprises allow employees to work with their own devices at the workplace. This allows enterprises to comfortably mobilize their business in a cost effective manner as they won’t require any device procurement. BYOD provides container approach inside all the enterprise apps which helps in securing the number of applications for enterprise. However, switching from container to personal space sometimes becomes a problem as policies restrict the use of both devices simultaneously. Moreover, the end users use a single device for personal and official work; which can cause a threat to the corporate information as it can be easily shared across personal apps. Hence, a comprehensive BYOD strategy is required to be implemented by the IT department. Enterprises supporting BYOD would require creating cross platform applications. In BYOD, the applications need to follow a uniform enterprise policy irrespective of the security level of the app. MobileIron, GOOD, AirWatch, KOny, AmTel, Symantec, Citrix, Cisco, Juniper etc. MCM stands for Mobile Content Management and MIM stands for Mobile Information Management. Enterprises use MIM/MCM to save and secure their sensitive data. Though MDM, MAM or BYOD facilitates mobility, the main concern of the enterprises is data security. 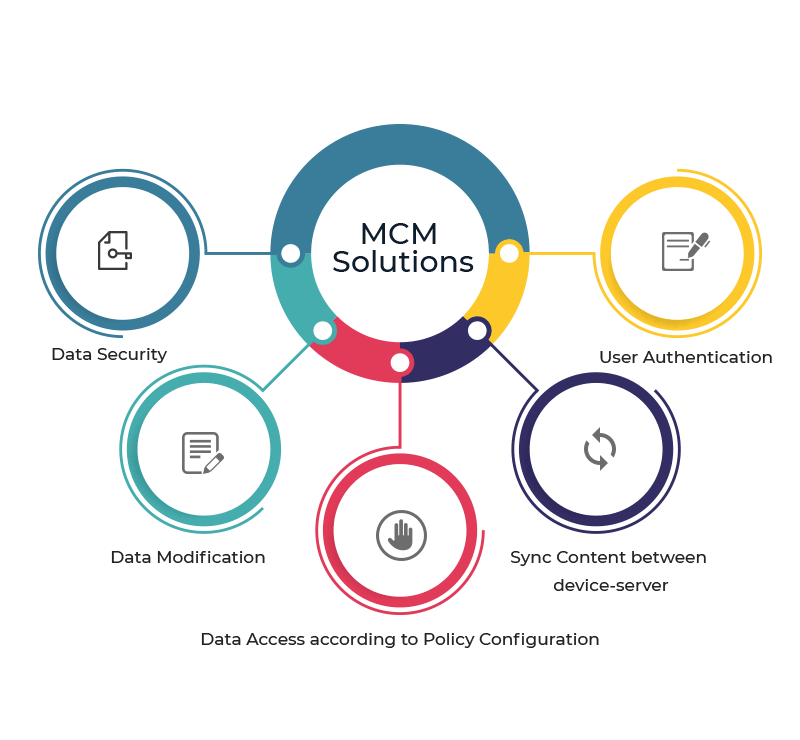 Therefore, MCM/MIM solutions can be used for better security and policy configuration. MCM/ MIM solutions require native mobile app for their implementation. This is because they work mainly with persistent memory of a device, which can be accessed through native APIs only. MIM solutions have limited platform support, for instance, iOS and android. Moreover, the focus of MIM solutions is around corporate data only; they don’t manage or control devices/applications. Not many vendors support MIM solutions. MAM stands for Mobile Application Management. It acts as a connecting layer between MDM and BYOD strategies. MAM manages the lifecycle of a mobile application. MAM solution can easily fit the MAC (manage, analyze and control) requirements of B2C, B2B and B2E industry. It offers integrity with app specific data and security. MAM solutions follow containerization approach in order to offer specific policy management and unique IT configuration. This allows the control to be available only at the level of container or individual app. The limitation of MAM solutions is that the validation and certification of applications detecting malicious code or malware is bit complex. 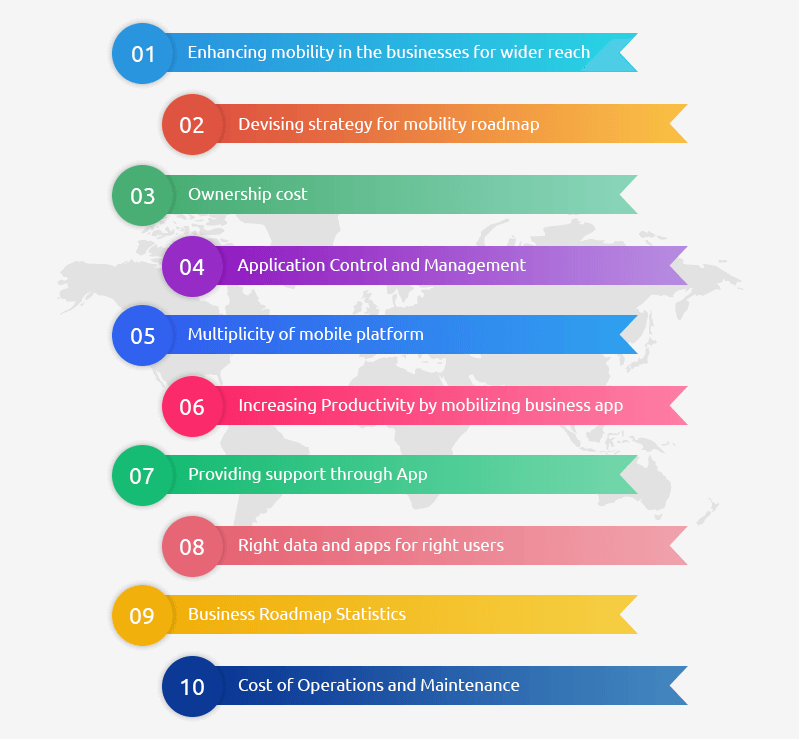 The shift of the enterprises towards mobility requires them to have a comprehensive mobile application management solution, which would help the enterprises to manage their mobile app deployments. The inundation of B2C mobile apps seeks more control over application version, data security, etc. ; more specifically in case of applications like Banking, Payment in which personal information is stored and transacted through mobile device. Multidots offers Mobile Applications Management (MAM) solutions to meet the needs of the enterprises so that they can easily manage their mobile app deployments. What are your views about Enterprise Mobility Management? Feel free to share them in the comments below.